Warning: You may find this gross! Did you know that poop is cute in Korea? It's true. Poop is typically represented in a cute way, like this giant one pictured above. 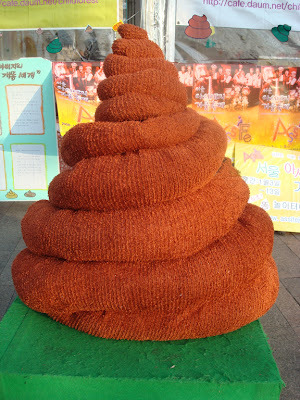 This poop was part of a poop booth in front of Seoul City Hall. The booth even had poop costumes little kids could put on. The cuteness of poop in Korean culture just goes to show the power of representation. Poop is typically drawn like the swirl above, sort of like the chocolate ice cream on a cone. However, it's not always this chocolate brown color. Gold is a very common poop color. And speckles aren't unheard of either. Poop can be represented in all sorts of fashions. Poop has even made its way into consumer culture. These products feature a character with a copper poop on his head. His name is Dongchimee (click if you are brave) from the Dalki product line. And he's just one of many poop-related products. There are books about poop, foam poop on a stick, poop stamps, poop banks and so on and so on. I'll collect more images and do a future post about this. Perhaps it's the combination of grossness and cuteness that give poop its appeal. I think it stems from the early cutified illustrations. What is poop in your culture: cute, funny, gross? I think that is gross. I hope they don't have poop-scented perfume! It seems they are interested in poop that are in that particular position, like dog poop. Maybe poop in any other position is not cute...? Poop is almost always drawn in that cute style. However, I have seen a children's book about a mole who gets pooped on. He then goes around asking all the animals "Did you poop on my head?" and then compares the poop on his head with their different shape and size poop (I never realized the variety!). Finally, he figures out it was the dog and the book ends with the dog getting a tiny mole poop plopped onto his head. 'Who shat on my head?' ^^ well, that's what someone told me it's called. There's also a 'dong' museum or it might have been an exhibit in one of the larger museums- yep, very different culture. Well, it's around 42 degrees here during the day now but it's about 15 degrees in Seoul eh? Glad I'm not there for Korean Winter. You have a giant robots book? Do tell me more! By the way, I have some posters pictures to share with you soon. Yes, it is very cold here now. It snowed heavily a couple days ago which has been really cool. Yes, when I was there, I also was puzzled about the pop culture preocupation with poo. If you have Comcast digital cable, I believe it's on "On Demand" right now. Ha ha, Adrienne! That Doggy Poo story sounds great! Poop is the best thing ever. poop is my life. go poop. save the wild poop. woo. Poop is indangered and we need to save it before they all go extinct. SAVE THE POOP. 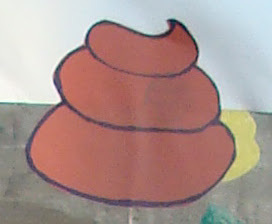 Actually, the 'poop' graphics and concept in Korea became popular when this one famous cartoonist drew it in his cartoon. The young generation found it funny, and started talking about it, and that's when marketers thought the 'poop' items will sell to that targeted group. They started selling cheap 'poop' items, and people buy them as a practical joke nowadays. 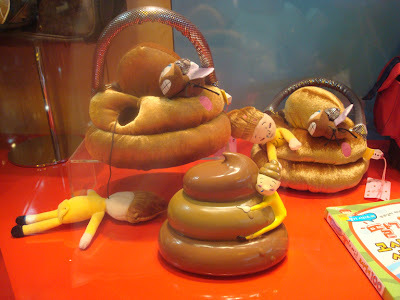 Hence, the poop in Korea is cute only when portrayed in a certain way. SuJu made his movie about flying poop in pretty boys faces!! 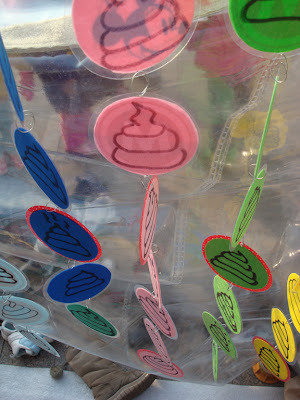 Poop is a traditional symbol of good luck in Korea, especially re: gambling odds. If you dream about poop, something good will happen to you. Or you should buy a lotto ticket. My co-teacher told me that when she was in college cramming for English exams, she fell asleep at her desk from exhaustion one night and had a dream of going to the bathroom. She went to the toilet and it was filled with poop so she tried to flush it. It wouldn't go down. One turd jumped out of the toilet and started crawling up her arm. Then she woke up. She was telling her mom this dream as they were driving down the street and her mom stopped the car in amazement and said tearfully, "Oh sweetie! You're going to pass the exams!!" Not to reduce the symbol of poop to ONLY wealth or good luck...but it goes deeper than cuteness. It seem to be a traditional preoccupation.